Rose Cottage is situated on a 3.6 hectare lifestyle block surrounded by sheep and beef farms. Its slightly elevated site gives stunning views of rolling hills and valley through to distant ranges. 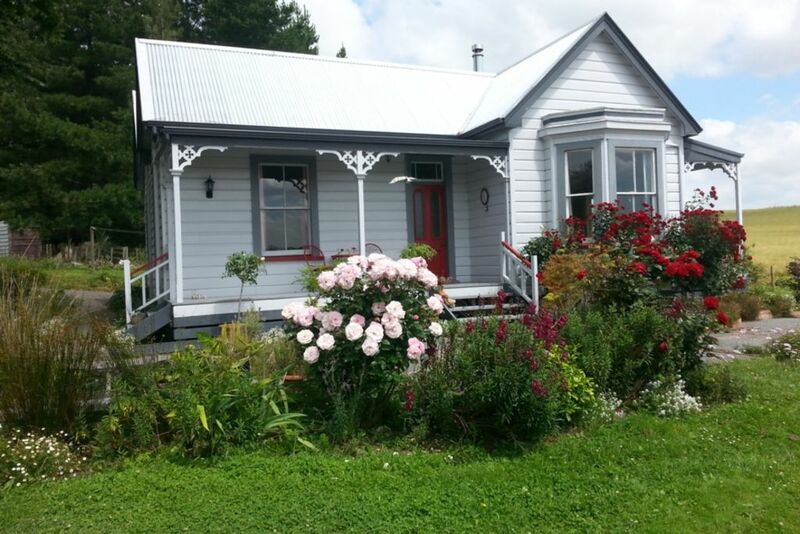 It is located 14 kilometers (12 minutes) from Waipukurau and 20 kilometers from Waipawa with ready access to east coast beaches, golf courses,rivers, fishing, cycle ways and tramping tracks. Enjoy retail therapy in the quaint and original shops of our rural towns, visit art galleries and the Settlers Museum. Being only 45 minutes south of Hastings it is also handy to all the attractions of the twin Hawke's Bay cities of Hastings and Napier and their surrounding beaches, vineyards and orchards. Pets allowed with prior approval and a $20 charge. Use of children's play area and equipment only with adult supervision. Children must be supervised if wandering on lifestyle block. Located on Central Hawke's Bay scenic and cycling route. Comfortable. Well equipped with quality towels, linen etc. My overall impression is that the owners have gone out there way to give the home a real "old homestead" feel and have lovely treasures all over the home. Very trusting people. Is the sort of place I could easily spend a lot of time in. It was a wonderful experience to stay in this lovely Bach. Dee and David made a cute spot of this old cottage and restored everything with love and a perfect sense for the old house. They are so helpful and friendly and made our stay great. Thank you! Deidre and David are wonderful hosts, and it was lovely that we were able to stay in this gorgeous villa which has been so lovingly restored. No detail is over looked with water, milk and other essentials there for us on arrival. As a bonus the night sky was extraordinary and it was lovely to be in such a tranquil place. Thank you both very much. Our family had a very relaxing stay even our four legged one. She might have tried to bark at your lovely dogs but they were friendly and gentle. Would be nice though if TV set is placed where the bookshelf is. Would definitely come back if were in the area and recommending it to friends. Thank David and Deidre and your lovely family who met us when we arrived and took time to talk to us.